In Aug-2014 China Southern Airlines reached a group fleet of 600 aircraft. Asia’s largest airline is now about to face a number of new problems, none individually large, but collectively unwelcome: its first direct LCC competition with 9 Air launching at China Southern’s home of Guangzhou, pushes from the government for expensive long-haul routes and managing subsidiary Xiamen Airlines’ entry into long-haul markets with 787s, the first of which it received on 31-Aug-2014. The challenges may seem overstated: international routes are still a small fraction of China Southern’s capacity while LCC inroads will be gradual. But the impacts can be disproportionately large, and account for the difference between a profit and a loss. These are untested waters for China Southern, and it enters in a weak position having achieved a 1H2014 operating margin of only 1.5%. At the net level, exchange losses pushed the airline into the red. Guangzhou is China Southern’s home and largest base by far, and will soon experience LCC competition from start-up 9 Air. 70% owned by Shanghai’s Juneyao Airlines (a cost efficient “boutique” airline), 9 Air received its first aircraft, a 737-800, in Aug-2014 and is expected to launch in Sep-2014. 9 Air will cover domestic routes and, after regulatory blessing, short-haul international routes. China Southern management has not expressed concrete views on how it will respond to 9 Air, only saying it has made unspecified preparations and that it expects 9 Air's growth to be slow. 9 Air is not China’s first LCC, or even one of the first. Spring Airlines is China’s highest-profile LCC and has been operating since last decade’s wave of liberalisation that welcomed start-ups. In the last year there have been additional airlines joining the LCC scene, including West Air and China United Airlines. But these new LCCs are being converted from existing full-service airlines. History has few examples of airlines successfully becoming low-cost, with culture and cost change a considerable burden. The environment in China is made more difficult since policies applicable to LCCs are yet to be defined. 9 Air will need to prove its cost credentials, but in theory starting from scratch will present it with savings – which will challenge China Southern. It is true that 9 Air’s tiny size in Guangzhou will, for the medium-term, be noticeably less than China Southern’s. But in a margin business a handful of unprofitable routes can drag down the business – especially when new entrants are likely to pick some of the most lucrative ones. Irrespective of competitive pressure, 9 Air’s performance will serve as a contrast to China Southern’s. This assumes that with time 9 Air will be more profitable than legacy full service peers, and before then will be more operationally efficient. Investors are already following the LCC sector, seeing it to be more efficient with potentially greater returns than full service airlines. Regulators meanwhile are on a quest for efficiency, and have already publicly upheld Spring Airlines as a cost-efficient leader across many metrics. Regulatory support for Spring is significant, not just because the airline is privately-owned but because for so many years of its existence it had to fight to grow; now it is Beijing's darling. China Southern management says it is watching the LCC developments across the country but does not yet have anything to announce. (However, China Southern's Chongqing-based subsidiary Chongqing Airlines is reportedly transitioning to the low-cost model.) Although this may sound like typical legacy denial, management is probably right that the environment to make a LCC move is not yet ready, while government policies to support and nurture LCCs are being finalised. Likely still to be unanswered for a while is the most significant question: the ability of China’s state-owned airlines to restructure and reduce bloated workforces stereotypical of state-owned enterprises. A successful restructure could negate the need for a separate LCC brand. 9 Air is looking to make a first move, even if it may not launch under ideal policies. LCC conversions like West Air and China United Airlines are becoming LCCs piece by piece. For now there is still much to do: since announcing itself as an LCC, China United Airlines has re-branded first class as business class, following China Southern’s lead. An assertive LCC would have eliminated a premium cabin on short-haul flights in a price-sensitive market. West Air and China United are arguably so far making changes suited to their geography and networks, which do not generate strong premium traffic. West Air is based in Chongqing, where incomes are lower than on China’s east coast, while China United is based in Beijing but serves more regional routes. The next step for these carriers is to demonstrate low-cost credentials and ability to stimulate growth through a lower cost base. For this, the carriers must – first with regulatory blessing – move beyond a few areas to a holistic examination of the business. There will likely be a number of revisions at new LCCs. Making multiple turns at a giant ship like China Southern will be difficult; there is an argument for hastening the change period. China Southern will also need to assess the future of short-haul premium traffic before potentially giving much of it up. These are changes to last possibly well into the next decade, so it would be wise to wait for the economic environment to settle. Clearer prospects are likely to come with the government’s next five-year plan, which will in turn shape regulatory thinking. China Southern management at its full year 2013 results briefing sought to convey that its long-haul route network would be completed with the Aug-2014 launch of a New York JFK service. But that was clearly never going to be the case, as China Southern was still expecting delivery of a number of long-haul aircraft, needing to better deploy its existing A380s and reaching its target on Australia/New Zealand services. China Southern has come under pressure for its fast international growth, designed to allow it to catch up to peers more exposed to the international market. The failure to find suitable routes for its A380s, largely leaving the fleet to operate domestically, created more pressure. China Southern repeatedly emphasised long-haul growth was a long term proposition that would take longer to realise gains than from other carriers. New routes besides New York, supposedly the last piece of the puzzle, have been opened (Wuhan-Moscow) or planned (Changsha/Wuhan-San Francisco). China Southern argues these routes are different as they receive government subsidies, and China Southern says it will only open long-haul routes if there is a subsidy. It is most bullish on North America, believing the market to be the most sustainable. (CAPA has recently published a four-part report on the growth in larger North Asia-North America market. While the subsidy level for China Southern's routes is unknown, it is unlikely to fully cover what are surely losses. China Southern takes the view that subsidised routes help offset the cost of gaining international experience, and allow it to develop faster than it could with only profitable routes. Existing long-haul routes remain largely loss-making, although the losses are narrowing. The Guangzhou-Los Angeles A380 route has been unprofitable, which China Southern attributes to a lack of premium traffic and operating restrictions on the west-bound sector, but Los Angeles was profitable in Aug-2014, the peak operating month. Management acknowledges its A380 network is sub-par, owing to its inability to secure rights out of Beijing. China Southern may thus be looking to operate long-haul flights out of Shanghai. Losses in Australia are narrowing, and it is uncertain if China Southern will be able to meet growth targets. Australia is content to dispense additional traffic rights to China but the Chinese government has held off so airlines can first improve their financial position on existing Australian services – a strong play of hand that indicates weakness but also Beijing’s concerns that airlines do not always act as rationally as they should. China Southern's international transit passengers grew 5% to 1,062,000 in 1H2014 compared to 1H2013, while sixth freedom passengers grew 6.8% to 225,000. China Southern carried about 5.3 million international passengers in 1H2014, indicating its sixth freedom role is still very small. Assuming the 225,000 sixth freedom passengers are defined as having taken two international flights, sixth freedom traffic comprises under 9% of China Southern’s total international carriage. Meanwhile weekly hundreds of thousands of sixth freedom seats out of Australia alone fly via Hong Kong, Singapore, Dubai and other points. China Southern’s marketing of sixth-freedom flights is much larger than what it carries, but China Southern would like to increase this traffic to balance the large low seasons in China, some of which correspond to peak travel periods in sixth-freedom markets. Given the competitive nature of sixth-freedom traffic, and what can be restricted air rights in China, China Southern is logically pursuing traffic to/from China as its core business. 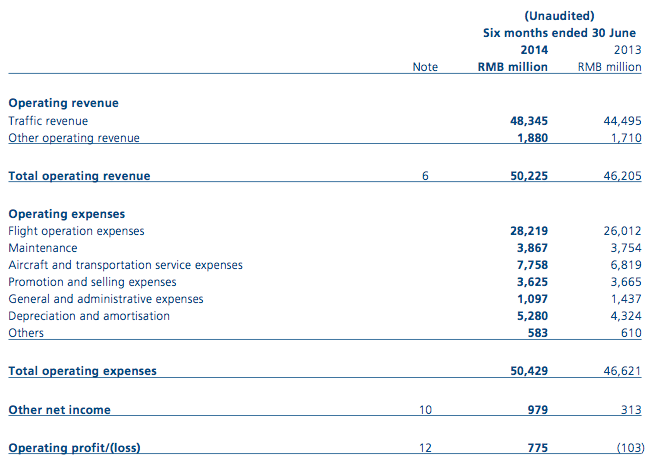 Transit revenue amounted to what China Southern calculates as RMB600 million (USD98 million), a 6.5% increase – about the same growth as transit/sixth-freedom passenger numbers (perhaps partially distorted based on distance flown). China Southern will also need to balance long-haul development at subsidiary Xiamen Airlines, which on 31-Aug-2014 received its first 787. Xiamen has been a primarily domestic carrier, and relatively well-run and profitable. That raises concerns for Xiamen about operating long-haul routes from a less than ideal hub; suffice to say that the 787s were not management’s idea. Xiamen has mooted service to Australia, Europe or North America. The first long-haul route, likely at least six months away, could be Fuzhou-New York, the largest unserved trans-Pacific city pair. However the route is intensely price sensitive with mainly leisure travellers. Xiamen’s 787 has business and first class seats. Xiamen’s main hubs in Xiamen and Fuzhou are in south China, partially overlapping with China Southern. Losses could be significant. Local reports from Aug-2014 indicate China Southern and Xiamen will both operate on the Fuzhou-New York route, possibly combining their frequency for a more robust offering. China Southern technically returned to the black at the operating level in 1H2014, although this with only a 1.5% operating margin compared to 1H2013’s negative 0.2%. But the difference is at the net income level, with government subsidies more than tripling. Without them, China Southern would not be operationally profitable. Yet it is difficult to fully analyse subsidies as the specific routes or functions they are for are not disclosed. Without a certain subsidy, China Southern may not operate a loss-making route, alleviating weakness at the operating level. ASKs in 1H2014 increased 11.4% while RPKs increased 10.2%. But overall revenue and passenger revenue grew at a slower 8.4% due to yield declines. Domestic yield was flat although the load factor decreased 1.3ppt. China Southern was pressured by social disruption in Xinjiang province, where it has a sizeable domestic and international operation. Regional yields (covering the area of Hong Kong, Macau and Taiwan) declined 5.9%, largely due to additional Cross-Strait capacity; China Southern has a minimal exposure to Hong Kong and Macau. Offsetting the yield decline was a 1.9ppt increase in load factor. However, these declines are expected, and will continue, as the market grows. Regional capacity was up 25.3% and regional revenue was up 20.7%. International yields declined 1.7% while load factor improved 0.4ppt. International was dragged down by Southeast Asia, which has experienced weakening leisure demand out of China due to an assortment of reasons including political instability in Thailand, anti-Chinese protests in Vietnam and weak sentiment in Malaysia following the MH370 tragedy and isolated but publicised kidnappings. In North Asia, Japan’s performance remained weak for China Southern while Korea has performed very well, as has been the case with a number of other carriers. Passenger revenue was 90% of total revenue, indicating China Southern has barely diversified. Cargo revenue, about 7% of total revenue, increased 13% on the back of an 18% increased in AFTKs. On the cost side, fuel costs grew at a slower 7% while staff costs grew 13%, continuing their growth above capacity increases. Despite difficult conditions, China Southern in 2H2014 expects to maintain 1H2014’s system growth of 11% or even rise to 14%. This is likely faster than management would like, but as they (and CAPA) have noted, long term government plans are difficult to adjust for in the short-term. China Southern also remains focused on its, and the government’s, long-term objective that requires faster growth now so foreign carriers do not gain too large a share. China Southern's dilemma is that if it waited until it was ready to have a robust and sustainable international operation, it would be more difficult to mount and carve a market. Capacity growth will be slowing, and indeed already has. China Southern as a group introduced 70 aircraft in 2013, but plans only to introduce 42 in 2014 and expects to introduce less than 40 in 2015, then less than 35 in 2016. This is a notable contraction in its expansion but could be accelerated depending on future aircraft orders and replacement rates. Caution should be exercised before reading too much into plans a few years out that are still to be finalised. If the general slow growth pattern does emerge, it will be a welcome sign for China Southern to finally be able to create a more sustainable operation. But first it must face more challenges in a market increasingly being defined by change.